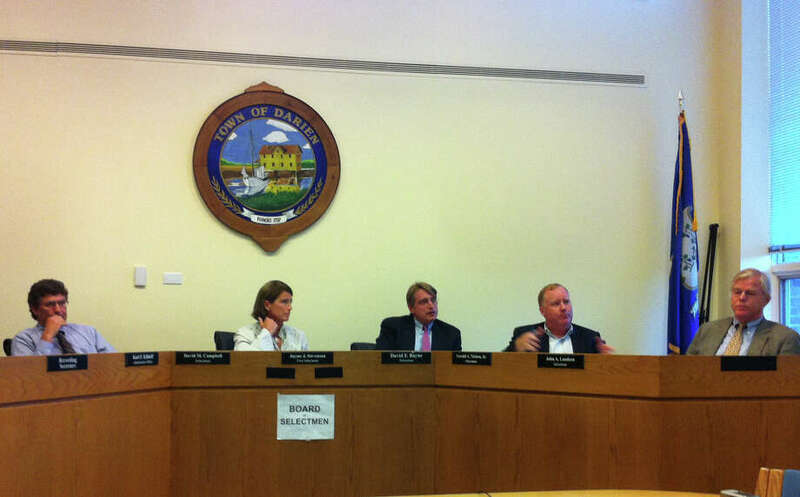 First Selectman Jayme Stevenson recommended the proposed ordinance for a plastic bag ban be handled by the Environmental Protection Commission in a board of selectmen meeting Monday night. Her recommendation was prompted by an email from Town Government, Structure and Administration Committee Chairman Sarah Seelye, who said Selectman David Bayne proposed the Health Department as the enforcer of the ordinance in a BOS meeting in September 2011. In a meeting earlier this month, the Advisory Board of Health did not take a position on the ban, since it does not consider the ordinance to be an issue of public health. "It's obvious when you read the ordinance it's born out of environmental concern," Stevenson said, along with her recommendation. She said the town has one EPC employee, Environmental Protection Officer Richard Jacobson, who would be charged with enforcing the ordinance if it passes. Bayne said he doesn't think enforcing a bag ban would greatly impact Jacobson's normal workday. "I think the critical thing to keep in mind is that enforcement may sound onerous," Bayne said. "But the way it occurred in Westport to my understanding is they don't go out actively pursuing retailers and investigating issues where there are complaints, they wait for complaints to come in." This is confirmed in Seelye's email, dated June 14, in which she discussed Westport's bag ban with Colin Kelly, the town conservation department's compliance officer. Selectmen David Campbell, Gerald Nielsen and Stevenson said they are against the bag ban. Stevenson acknowledged the Public Works Committee's research on town waste disposal, but said she generally has a problem making ordinances laws that she doesn't believe are enforceable. "I do look forward, I have to be honest, with the (Representative Town Meeting's) discussion on this topic," Stevenson said. "I am strongly against this ordinance, but I do believe it deserves public debate."